I look forward to BTCC Media Day 2018 like children look forward to Christmas. In my case, the official launch of the MSA Dunlop British Touring Car (BTCC) season, held at Donington Park race track, is a 600 + mile round trip from my home. So, a night before Media Day, I pack my GoPro, DSLR, laptop and plenty of spare batteries and chargers, into a rucksack and stay local to Donington in a B&B. Media day itself starts pretty early…7.30am to be precise. The kind organisers lay on a breakfast, and coffee, and representatives of all teams, sponsors, journalists and BTCC organisers all mingle in a large room set aside for the occasion. This year, 2018, the reception was held in a different park of Donington than before. At around 8.30am, the days events start. The chatter around the room dulls, and there is a brief presentation regarding the new rules, the season ahead, the choice of tyres etc, and then the drivers, sometimes looking quite nervous, are all hauled on stage and interviewed one by one in team groupings. The talk before the drivers intro is also actually really quite interesting and this year, the organisers were really quite proud to announce and show off, the official rescue vehicle to used at events this season. 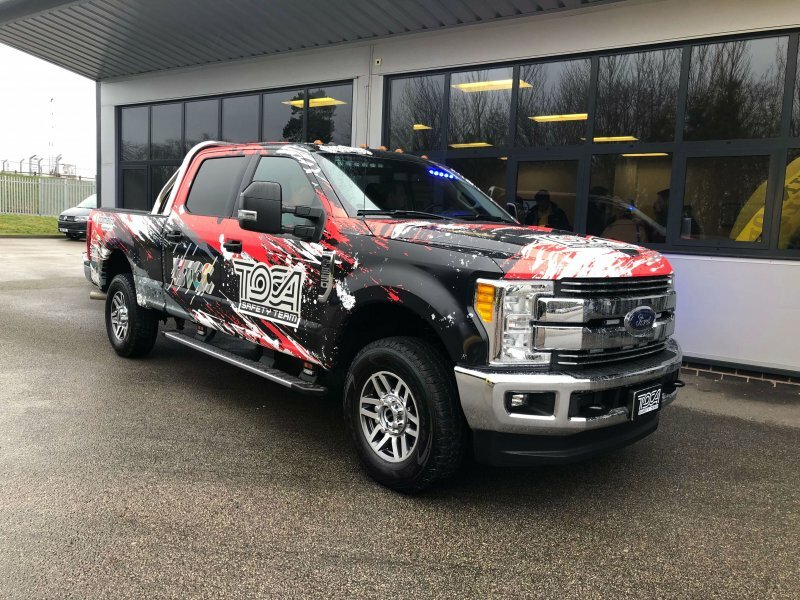 TOCA, (BTCC Series organisers) have invested a hefty 6 figure sum importing a new Ford F250 pick up from the U.S. And it’s HUGE! It will basically carry safety officials and paramedics, along with a lot of kit, to the scene of any TOCA event held, including BTCC. In fact, another interesting statistic mentioned to the eager crowd, is that of the number of personnel taken to each BTCC event purely for safety purposes is 23 people! That’s more than 2 football teams. As the compère of events rightly stated though, hopefully the TOCA vehicle won’t be needed as that’ll mean there were no serious incidents. The mention of tyres, provided (obviously) by Dunlop, was also of interest because BTCC have listened and considered spectating fans, by colour ‘banding’ the tyres this season (blue for wet) so at a glance, one can see what tyres are being run. Of course, 2018 is a little special for BTCC as well, as it’s 60 years now of the series. The series is actually the 3rd oldest race series in the world after F1 and NASCAR. And to help mark such an important milestone, this year there will be a special mid season 60 mile race at Snetterton, the precise details of which haven’t been announced yet. Another annual milestone is that of Dunlop entering their 14th year as Tyre supplier to BTCC, AND, Dunlop themselves are celebrating 130 years as a trading business. The drivers come on stage next, and the first thing I noticed about the drivers, was their size. Whilst they are of varying heights, they are all just so slim! Seriously. I wouldn’t consider myself particulary fat, but alongside these guys you soon begin to wonder if you’d actually fit through the gap between the roll cage and car roofs and into the snug fit racing seats. Maybe I shouldn’t have just had that complimentary bacon roll. For most of us, this unveiling of drivers is the first glimpse also of the new racing suits for that season, and perhaps a hint of how the cars may be decorated with the new sponsors livery this season. As Alan Gow said when he had his slot on stage, this season possibly has the best depth of talent in BTCC this century so far. And who could disagree as ex race winners, series winners, and long time series ‘celebs’ mingled side by side next to the main stage. After an hour or so of talking, the organisers are keen to take the crowds outside for the walk to the pitlane for the unveiling of the cars. These are unveiled one by one in garage order. Some teams chose to fire up their engines and drive out of their garage after the shutters are lifted, and others were pushed. Drivers and sometimes, Grid Girls and Mascots then posed alongside cars for the first official season photos. As a petrolhead, this is the first time one gets to hear the sound of these fantastic engines being fired up and even now at my ‘mid life’ age, that sound still gives me goosebumps. After the photocall in the pit lane, the cars are then taken on track and carefully organised for the official BTCC season pictures and a rolling lap whereby 3 rather brave photographers are perched on the back of a fairly fast moving vehicle with cameras pointed at persuing cars just a couple of feet off the rear bumper. Unlike previous years, the majority of photographers and sponsors etc weren’t allowed on track at this stage, but were allowed to watch from the pitlane wall. All this excitement was hunger inducing, and yes, that meant more food by way of lunch, this time very kindly laid on for me by the Laser Tools Racing team. From our lunchtime vantage point, we began to see cars leave the pitlane for the first time in their new liveries under the scrutiny of journalists, reps and sponsors, as well as now, the general public, who were allowed in at 12.30pm. Unfortunately, the weather wasn’t particulary kind this year and whilst slightly better than forecast, track conditions were nevertheless wet and greasy…as some drivers soon discovered. It’s less than 2 weeks from Media Day launch to the first race of the season at Brands Hatch this season, so teams hurridly returned to base after Media Day to correct any settings, and get the cars proper race-ready. We can’t wait. We just hope it stops raining! This article was written by ‘RH’ a media representative for RCIB Insurance Racing as a guest of Laser Tools Racing.